There was so much that was forward thinking about mid-century design that modernist objects are still used as shorthand to suggest the future. Which is maybe one reason that we forget that the modernists were heavily influenced primitive and folk art. The aesthetics of traditional African sculpture had a huge influence on Picasso, Modigliani and Brancusi. And the jet age brought more access to African and Asian furnishings. Hattie Carnegie was a an American designer (born Henrietta Kanengeiser) who was celebrated for her smart and simple dresses. Like Coco Chanel in France, Carnegie was a huge fan of bold costume jewellery. These fabulous fakes provided a touch of frivolity to her sleek and well made fashions. After the second world war ended, repatriated soldiers also brought back souvenirs from overseas home for their sweethearts. “Primitive” motifs became popular and Carnegie’s jewellery designers had a ball incorporating African textures and themes into their flashy designs. This little antelope (which I found at the St. Lawrence Market last weekend) is from a 1950s collection called Primitives on Parade. 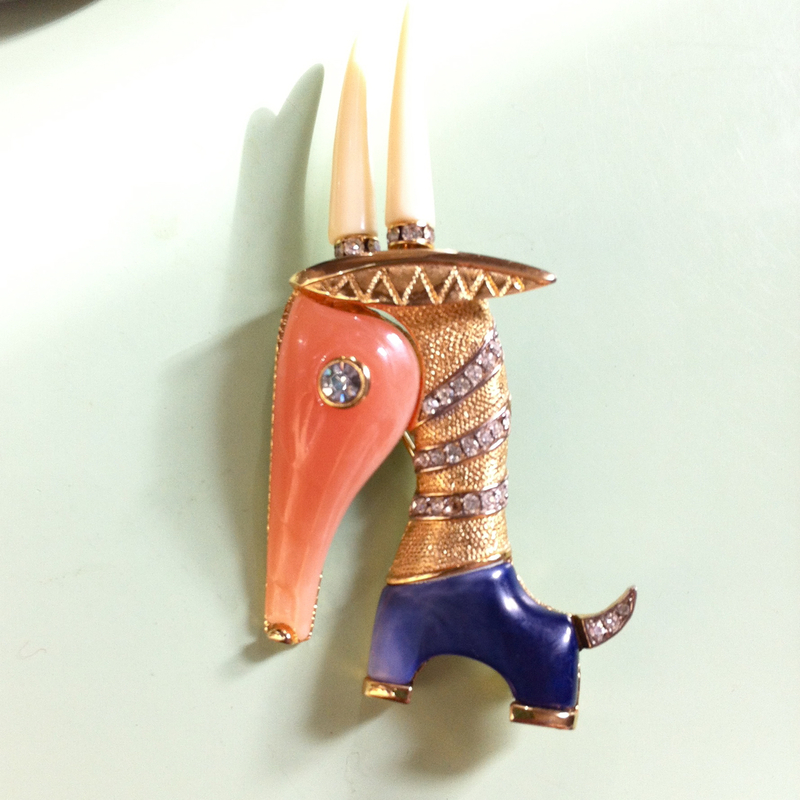 Designed by the legendary Kenneth Jay Lane, it features faux coral, ivory and lapis insets and loads of rhinestones. Take away the bright colours and sparkling stones and the stylized shape of the brooch would live comfortably alongside any Scandinavian jewel of the same era.